Fender cables are designed specifically for live performance and engineered to avoid twisting, kinking, and having any "physical memory." They deliver the best sonic balance between your performance and your equipment. he Fender Performance Inspired Audio Cable is designed to offer quality and rugged construction at an affordable price. 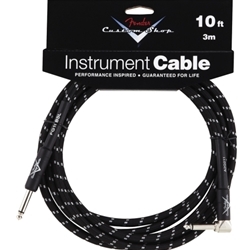 Backed by Fender's limited lifetime warranty, each cable will provide great performance you can rely on. Fender's Performance Inspired Audio Cables ensure what you put in is what you get out.